Vermuts Miró és considerat un referent en el mapa del mercat dels vermuts, i és així gràcies als seus productes Miró. L’expansió de l’empresa afavoreix la producció en massa, conservant la recepta original, que dóna als clients una àmplia varietat de productes Miró tots amb la màxima qualitat i prestigi que a marca ha adquirit al llarg de la seva història. Ara bé, sempre innovant any rere any. Els productes Miró que ofereix la marca et donen a triar en una amplia varietat de situacions on hi és benvingut un vermut. Actualment, els productes que es troben a disposició dels fans del vermut són, per exemple, el Miró Roig, Miró Reserva, el Miró Blanc, Rojo Fusión, Miró extra dry i petites ampolletes de vermut, entre altres fins a arribar, fins i tot, al vermut Miró Casero. Cada un d’ells preparat especialment per a una situació única, per a què puguis viure una història única amb qui et vingui més de gust. Els productes que pots trobar a Vermuts Miró són de qualitat excel·lent, i així ho demostren generacions de clients i usuaris que any rere any compren el producte amb etiqueta Miró. A més, no suficient amb els productes Miró actuals, l’empresa dels Miró ha volgut cada any innovar en els seus productes, creant així una varietat ben notable de nous i diferents begudes i aliments que ens deixin a tots contents, com ara el vi de cuina, moscatell, mistela o fins i tot perles vermut. Aquestes últimes, consisteixen en estratificacions de vermut recobertes amb una fina capa de gelatina d’etiqueta negra, que esclata amb el contacte amb el paladar. Tota una innovació. Així que, ja ho saps, si t’agrada el vermut i vols quedar satisfet amb la relació entre qualitat preu, Vermuts Miró és la teva millor opció. No te la juguis i dóna una oportunitat al vermut de qualitat. 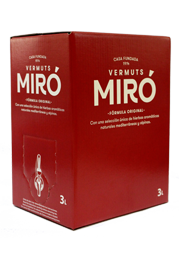 Based on the original recipe from the family, MIRÓ Rojo is the authentic Vermut de Reus. It has a deep ruby red colour in the glass, with dark orange-brown hues. Rich on the nose, this is a full and refreshing vermouth with aromas of natural herbs (absinthe, rosemary, basil…). Feel the balsamic notes, its sweet-bitterness touch, the creaminess and the satisfying long-finish that sparks memories of the original Vermut de Reus. Presentation: Bottle 1L. and 1.5L. Miró & Paco Pérez Rojo Fusión is a singular vermut, more complex, with touches of olives (arbequinas) and Mediterranean herbs (rosemary, thyme, saltiness). It is 100% Mediterranean freshness! On the palate, this soft and delicate vermut has sweet and bitter notes that merge perfectly with the seductive aromas that overflow from the glass, liquorice, orange peel, star anise… finishing in a long and elegant sensation. 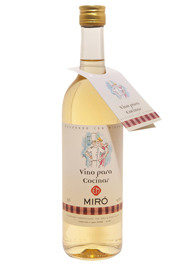 MIRÓ Blanc is the perfect blend of a dry white wine with a sweet, soft and fine touch. Based on the original recipe from the family (more than 40 natural herbs in its formula) that gives it its characteristic flavour, it is an excellent aperitif. 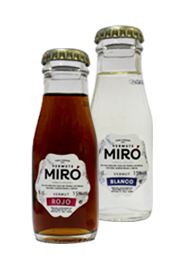 MIRÓ Extra Dry is a special recipe with very low sugar, a fresher aroma of berry fruits like juniper, clear, clean and soft. The main ingredient to prepare any good cocktail! 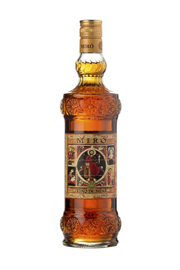 MIRÓ Reserva “Etiqueta Negra” (Black Label) is made according to the Miró family original formula created in 1957. 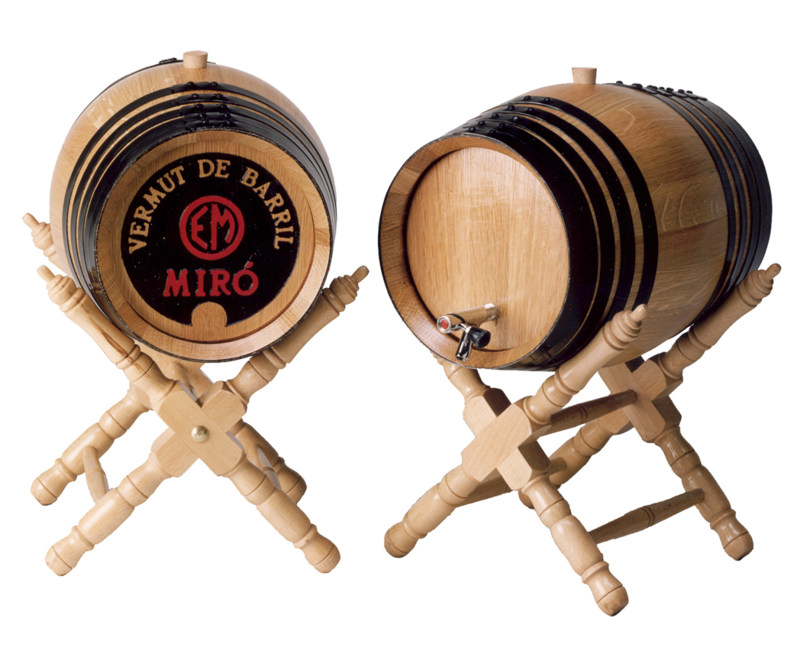 Miró Reserva is barrel-aged in “soleras” (over 100-year old barrels that belong to the family since the beginning) for a minimum of 6 months with a rich and velvety body. 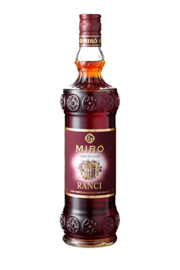 Miró Reserva is a dark mahogany colour with amber gold highlights, which when in glass fills everything with its aroma: warming notes of wood, liquorice, spices, and the freshness of the Alpine and Mediterranean herbs. All in balance, complexity and character. The longer aging process gives an additional layer of complex flavours from the barrel. Presentation: Bottle 1L. and Gift Box. Miró&Art is a limited edition of Vermut Reserva Etiqueta Negra in this artist-commissioned, illustrated gift box. The artist of 2018 edition is Claire James-Dupain. Find the mini bottles of Vermut Miró 6cl. Individual shots are the perfect amount to serve on the rocks or mix in cocktails. Ideal to keep in the fridge for every moment, for parties or afterworks. 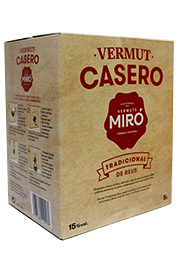 Presentation: Pack 8 u. and trays of 48 u.
MIRÓ Casero is made by selected table wines and a mix of natural aromatic herbs. We follow the traditional method based on the original recipe from the family. 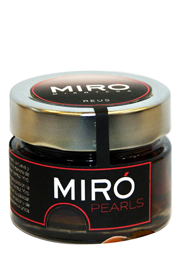 Miró Casero is ruby coloured, clean and clear, with an intense aroma of oregano, mint and caramel. It is a vermut with an honest palate, pleasant and a long finish. Vermut Spherifications: 0,6 cl. of Vermut Reserva Etiqueta Negra with a fine and delicate skin of jelly. These pearls burst vermut at a touch of the tongue. 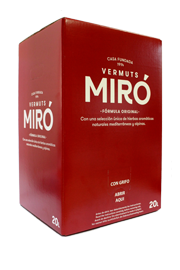 Based on the original recipe from the family, MIRÓ Rojo is the authentic Vermut de Reus. It has a deep ruby red colour, with dark orange-brown hues. Rich on the nose, this is a full and refreshing vermouth with aromas of natural herbs (absinthe, rosemary, basil…). Feel the balsamic notes, its sweet-bitterness touch, the creaminess and the satisfying long-finish that sparks memories of the original Vermut de Reus. 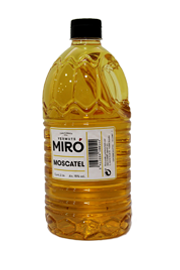 Moscatel Miralva / Miró is a natural sweet wine, made from excellent muscatel grape variety. When we got the grape must, we fortify it with wine alcohol up to 15% abv. Moscatell Miró Piramidal has an ageing in oak barrels. Our Moscatell has a straw yellow colour with golden hues and an intense fruity aroma from the muscatel grape variety as well as raisins. Creamy, silky, round and well-balanced, it has a pleasant and memorable long-finish. Best served at room temperature or chilled. Best pairings are desserts, cakes and nuts, as well as a part of many exquisite culinary recipes. 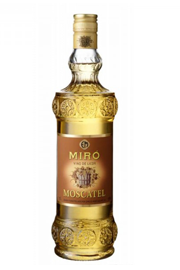 Moscatell Miró: Bottle 75 cl. – Carafe 2 L.
Moscatell Piramidal 50 cl. – Bottle 1L. – Box 3L. Rancio is an aged wine, very typical in the Tarragona D.O. It is a liqueur wine, 17% abv., made from red wines Tarragona D.O., that has to be aged in oak barrels for at least 3 years. It has a mahogany colour, clean and clear. On the nose, a complex fruit character that comes from deliberate and controlled oxidation of the wine. It encompasses aromatic notes reminiscent of mixed nuts with a touch warming spices, caramel and toffee. Very singular with full body and a long aftertaste, Rancio is ideal for drinking with sweets, nuts or as an after-dinner wine. Presentation: Bottle 75 cl and Piramidal Bottle 50 cl. 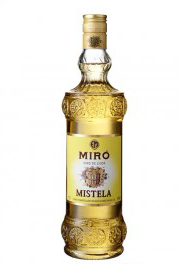 The Mistela is a typical generous liquor (15% abv), made from grape must and alcohol. Our Mistela has a straw colour, clean and clear on the glass. It shows plenty aromas of the brandies used and raisins, jammy and fruity. On the palate, it is silky, well balanced between sweetness and freshness, with a pleasant finish. Special wine for cooking. It is a dry, crisp white wine (14,5% abv) macerated with a mix of natural herbs from the Montsant region. It is very versatile; it is particularly delicious in seafood soups, vegetal dishes and it is brilliant with meat or fish recipes, bringing a nice touch of the aromatic herbs and depth to your sauces and menus. Presentation: Bottel 1L and 1,5L. 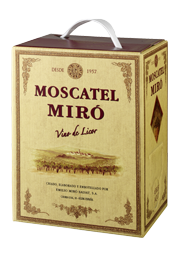 The Altar Wine Miro is a fortified wine of 15% alcohol. It is a blend of white local grapes (moscatell, macabeu, airén). It is elaborated with the partially fermented grape juice –after removing the skins and seeds- into which wine alcohol is added to stop the fermentation when, approximately, two-thirds of the wine has fermented. This way, the wine will have good alcohol content (15%) while leaving a high concentration of natural sugars. Finally, and in order to obtain some specific aromas of this fortified wine, an oxidative process is carried out for a minimum period of three months. It has a bright yellowish/reddish colour with brown tones. It shows an intense aroma, yet with a soft nose of ripe grapes with subtle notes of walnuts and spices. The Altar Wine is accompanied with an Ecclesiastical Certificate. It is a fortified wine, a Port-style, semi-sweet, 17% abv. It is made with red grapes and aged in big oak casks. 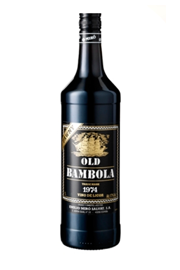 On the nose, the Old Bambola is certainly grapier, with red fruits aromas like cherries and prunes. On the palate displays an impressive mouthfeel, full-body, super silky and notes of the fruits, spices and toasty. Serve chilled as aperitif or with the desserts, as well as cook amazing recipes with Old Bambola. Presentation: Bottle 1L. – Carafe 2L. Thank you for visiting us, but before we need to confirm that you are of legal age. Do you have more than 18 years?